It’s official! Lightroom has joined Adobe Creative Cloud. To this point, Photoshop, Indesign, Premier, Illustrator, and others have been a part of the Creative Cloud and enjoyed the constant and simple updates and the inter app connectivity of the cloud. But Lightroom has always felt like the outcast from the group. Today, though, it’s official; with Adobe’s release of Lightroom CC today, Lightroom is now a legitimate part of the family, and that means the future is very bright for Lightroom. With the designation CC, comes more frequent and automated updates to the program, which will be a welcome change. It also means we can expect greater inter app connectivity in the future. Some apps are already taking advantage of the Lightroom Mobile sharing, like Adobe Slate, which can draw from any of Lightroom’s mobile shared images. I think the CC designation was long over due, so I am glad Lightroom has finally gained its spot on the Creative Cloud. Of course there are a number of new features and capabilities in the new Lightroom CC, which Matt Kloskowski and I will be reviewing on CreativeLive. Import, export and general computing speed has been increased by allowing Lightroom access to the graphics processor with GPU Acceleration. This is not a toy kind of feature that people get to play with, so I suspect it won’t get the face time it deserves. 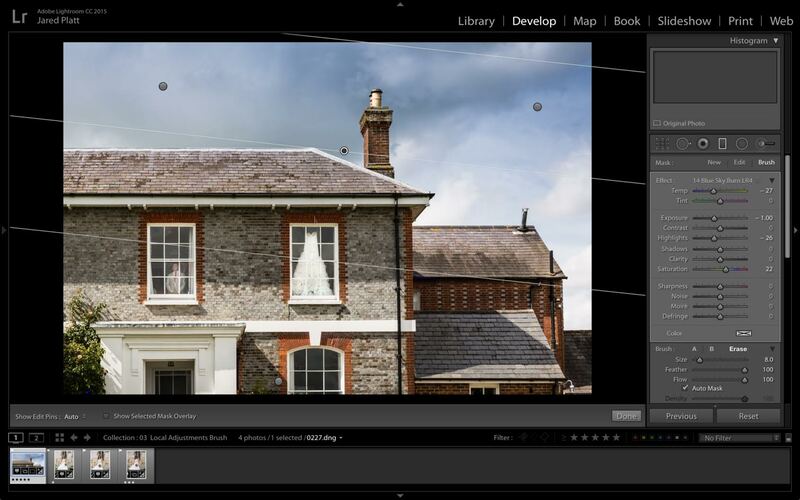 It is no small feature and will improve the entire experience of using Lightroom. A simple little feature like this one, makes a lot of difference in simple speed of organization. Previews based on the size and need of your monitor. The quick develop buttons have finally been given a dose of subtlety. This one is revolutionary! No more going to Photoshop to merge TIF versions of your RAW images and round tripping back to Lightroom. Lightroom CC will now merge your RAW images into Panoramic and HDR images and maintain the images for true RAW manipulation. This will open up new worlds of possibility for photographers everywhere. It means I will actually start to use HDR and Panoramic techniques in my work. I have been waiting for this one for a long time, and it is finally here. Brush pins can now be moved, which allows for far greater synchronization of the local adjustments between images. Now, with the introduction of a modification brush tool inside the radial and gradient filter tools, working on images feels a lot more masking in photoshop. Now I can make broad strokes with the gradient and radial filters and then erase back the areas that have over stepped their bounds. This is one of my favorite features. 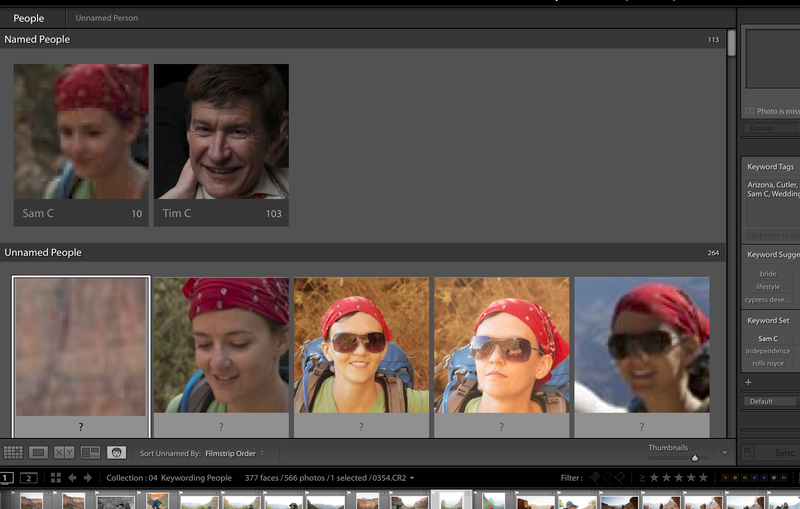 Lightroom CC has facial recognition built in! Imagine the ramifications of this for event photographers who need to identify the people in their images for more accurate and faster image tagging. Suddenly massive amounts of key-wording is something that can be done literally in ones’ sleep. The slideshow module also gained a few new features, including the Ken Burns effect and synchronizing slides to the music. Of course, this is not an exhaustive list. Matt Kloskowski and I will be reviewing these and more features today on creativelive.com and I will be going into incredible depth on these tools and more during my new CreativeLive course, Lightroom Crash Course, featuring Lightroom CC. During this course we will not only show you what is new in Lightroom CC and how to use it, but also how how it fits into the overall post-production workflow. I am truly excited about the release of Lightroom CC with its list of new features and all that the CC designation offers now portends for the future of Lightroom. Lightroom’s future looks bright. Office Hours LR Aperture Import from Jared Platt on Vimeo. Finally, there is a way to take your entire iPhoto or Aperture library and import it into Lightroom. This video will show you how to accomplish this task. Now you can take all those photos that have been held hostage by Apple’s ridiculously bad photo software and get them into a system that makes sense. You will need to download the latest version of Lightroom 5 and Adobe’s Aperture Importer plugin for Lightroom, which I show you how to do on this video. Use The Right Click in Lightroom from Jared Platt on Vimeo. So many questions can be answered by simply right clicking in Lightroom. If you want to do something to anything in Lightroom, try right clicking it and see what you get. This is just a short list of things that the right click can do and by no means exhaustive. Just right click everything in Lightroom, even the little triangles at the edge of the screen, or the individual section headings on the left and right panels. Spend 20 minutes just right clicking. It will answer so many questions that you will no longer have to ask me about. As much as I like being needed… I’d rather have you exploring and discovering things for yourself. So, I decided to do a test. I do a lot of tests… but I swear I do not have OCD. But my obsession, turns out to be to your advantage. First, I enlarged this image in Photoshop with the Perfect Resize 7.1 plug in to 30 inches wide at 300 dpi. The results were acceptably good for the print. You will see on the image below, that the process of resizing an image tends to create a painterly texture, but when printed, that texture is generally swallowed up in the texture of the print surface and the grain patterns of the emulsion. So, I am pleased with the results and they will print nicely. But, remember, I had to open the image in Photoshop and run it through the Perfect Resize plugin or run it through the Perfect Resize plugin in Lightroom, which has a very slow interface. Then I went back to Lightroom and simply exported the image from Lightroom and told Lightroom to enlarge the file to 30 inches at 300 dpi with a standard print sharpening added to the image on export. The process was a lot faster than dealing with the Perfect Resize interface and the results were just as good, if not better. If you look at both images on the dark pupil and iris of the eye, you will see more of a painterly texture with a bit more banding in the Perfect Resize enlargement above than you will in the Lightroom version below. So I wanted to see if I could do it even better right our of Lightroom without using any other software or Plugins. And I promise, I am not OCD, I am just curious! So I added a bit of grain to the image in Lightroom. You can certainly see the grain in the image below, but observe what it has done in the pupil and iris area. No more weird patterns. I’m going to go with the added grain and no painterly patterns. It is far more beautiful and takes a fraction of the time to make the enlargement. Now, this was a fairly simple enlargement from 20 to 30 inches. I am not saying that Perfect Resize is not a good tool for enlargement, it is very good, and indispensable when it comes to extreme enlargements, but for the day to day enlargements, I find that Lightroom does a fantastic job all on its own. So I will trust Lightroom to make the enlargement and save my time for the more important things in life. Now, I’m off to help my son solve an particularly hard level on Angry Birds. For a step by step lesson on what I did to get these results in Lightroom, see the Lightroom Podcast below. Making Photo Enlargements in Lightroom 3 from Jared Platt on Vimeo. There are plenty of plugins and photoshop methods for enlarging photographs beyond their native size, but Lightroom 3 can match or beat even Genuine Fractals or Perfect Resize on standard every day enlargements. In this video you will learn how to use Lightroom to enlarge your digital images without the use of Photoshop or a Plugin. The New Math of Lightroom 3 (process versions) from Jared Platt on Vimeo. I just posted this new podcast. For those of you using Lightroom 3, it is worth the watch. It is a tech topic, so if you are not a photographer, at least it has a photograph of a very cute kid! This little guy is a complete ham. Lightroom 3 has a few great new features in it, but the best feature is the math behind the curtain. This is what Adobe calls a Process Version. It is essentially a new set of algorithms and other mathematic equations that I would never understand, that make our images look better. And all throughout high school, I thought math would never be useful to me. It turns out that it is very useful, as long as someone smart employes it in my photo software. Lightroom 3 can employ the older math from 2003 (used in LR 2) or it can employ the new math inherent in LR3. The new math is beautiful and worth updating images that you are taking a second look at, but it is not advisable to update everything all at once. Check out this podcast to find out why. I have a list of favorite new features in Adobe Lightroom 3.0 but the best feature is the speed. It is so much faster and more responsive than the prior versions. They did a great job with it. I am looking forward to teaching my fall workshops with the new version. See you all out there on the road. Check out the tour schedule at www.jaredplattworkshops.com. Adobe Lightroom 3.0 My Favorite New Features from Jared Platt on Vimeo. Lightroom 3.0 is faster with lots of new features. This video is a list of my favorite new features in Lightroom 3.0 and how I use them. I just posted a new Adobe Lightroom Tutorial Online about Syncing Lightroom Catalogs. If you are using Lightroom professionally or as an amateur, it is worth watching. If you don’t know what Lightroom is and you just like look at my photos, your eyes might gloss over, so just skip this one. If you like falling asleep to the sound of my voice, go ahead and turn it on, it’s 20 minutes, to you should be asleep before it is finished. You may have two or more computers, or be working with a post production company like ShootDotEdit for your post production on your images, but whatever the reason, you will need to know how to synchronize your catalogs from one computer to the next. Adobe Lightroom’s catalog portability will allow you to share your work load between computers, locations and people. In this 20 minute lesson, you will learn how to synchronize your images and catalogs from one computer to the next and even between Lightroom and Camera Raw in Photoshop. For more Lightroom and Photography lessons and to learn more about my workshops, go to www.jaredplattworkshops.com.